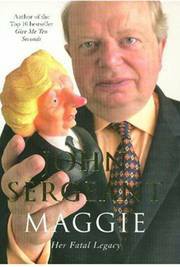 John Sergeant is perhaps one of the best placed individuals to write a book on the Thatcherite legacy, Lady Thatcher’s dominance over the Tory Party and her presence in British politics. From his place as a leading broadcast journalist with the BBC and ITN he is completely separate from the party – thus preventing any overspill of internecine party warfare that he chronicles in the well written ‘Maggie: Her Fatal Legacy’. Stating throughout that he is not of the conservatism of the time, Sergeant gives relatively little attention to the Thatcher ‘revolution’ of the 1980s, merely glancing at the 1981 budget, the Miners’ Strike and privatisation compared to the dominance of the European question and her style of leadership towards the end of her premiership and beyond. And in reading it we get an evaluation of Thatcherism in waves and not as a complete, streamlined or coherent ideology. The first two discernable waves were securing her political authority and setting the domestic agenda along her lines. Sergeant points out, the now discovered and well repeated political fact, that Lady Thatcher didn’t go into the 1979 election with a holistic manifesto complete with specific promises on tax and industry. While he notes the discontent at her leadership, not only from Heath’s longest sulk in history, but that had Callaghan gone to the polls in 1978 Thatcher might not have won. Worry about Thatcher was widespread as she initially seemed a liability, underperforming at PMQs. Her authority was in question. Hence the need was to stamp her dominance on the party after the election, aided by the 1981 budget and the subsequent reshuffle, the Falklands conflict and the landslide in 1983. By her second term she was secure, without question. The second wave was what we’ve come to know as ideological Thatcherism, taken in the positive as being the reorganisation of the British economy during the second term, limiting Trade Union power and promoting, to use Redwood’s phrase, popular capitalism. Here, using Redwood as an example, Sergeant makes the point – perhaps not exactly well realised outside academic or political circles – that Thatcherism was more of a group effort than her work. From Keith Joseph, to Howe, Lawson (perhaps even further back to Enoch Powell) in parliament and the likes of Redwood, Hoskyns, Sherman and the think-tanks outside, Sergeant unravels Thatcherism in his conclusion as being more than just her doing. She was the figurehead and had convictions that leaned in the ideological direction of the New Right, but she was not ‘one of us’ when it came to New Right Tory intellectualism. Of all subjects, Europe is at the heart of Sergeant’s narrative and has as much reference as the Lady herself. Lady Thatcher turned against Europe when it was made markedly clear what the effects of the Single European Act, the European Exchange Rate Mechanism and Economic and Monetary Union would lead to. Precisely when she came to this conclusion is for debate. This historiography will continue to split among pro and anti-Thatcher lines, however. Her critics, well interviewed by Sergeant, claim she knew what she was signing up to in the first place. A case in point involved her acquiescence to ERM when John Major recommended entry, even though she’d promoted him as Chancellor to replace Lawson, who also backed ERM entry. Sergeant therefore discreetly makes the point that it was never Thatcher’s cabinet. When she needed them, they never rallied when it mattered. They may have fell in line on privatisation, even the poll tax, but on Europe, everyone stuck firm to their positions. It would be the cause of her downfall. Whatever the reasons for the turn against the EEC, however, Sergeant’s rationale for the final wave of Thatcherism was the preservation of what Thatcher had accomplished against an EEC whose powers were encroaching to the extent that it was they, and not a future British government, who were accumulating the power to undo all she had done. This is the crux of the legacy and the clash that caused the Tory infighting in the 1990s. Like Heath asked, who governs Britain? Sergeant argues that Thatcher’s intensity of opposition to the federalist path the EEC was on came from leaving office and surrounding herself with ideologically pure advisors. That she had both a view of politics detached from government and advisors still loyal to her allowed an incremental intensity of belief that what she had been doing was right, the manner of her departure was wrong and that what was being done by John Major, particularly on Europe, was threatening to undo everything she had fought for. In particular, the key problem found – but little highlighted by Sergeant – was the fact that John Major made the adherence to the Maastricht Treaty, especially after the Danish ‘No’ vote, a matter of confidence in the government. As each side became more determined, either in saving or bargaining away British sovereignty, damage would be done as each side dug its heels in. The Tories became unpopular not because of euroscepticism but because, in the end, the head was determined to rip itself away from the body and attach itself to an altogether foreign body. After the Danes voted against, why would anyone have committed to Maastricht with the intensity Major had? Thus we get the Thatcherite backlash. His threats to call an election if Maastricht did not pass, to any reader, look like he was willing to sacrifice all in the name, and integrity, of the Euro-federalist agenda. Put in perspective, therefore, Thatcher’s constant outbursts against Major’s European policy seem sensible in the climate. Live or die, the government was going to squander the Thatcherite inheritance - all for the pottage of the European Union and the risk of a subsequent Labour government. Thatcher’s legacy, therefore, was the resistance to the encroachment of a foreign power that could have undone the work that Howe, Lawson, Major and Thatcher had done in the 80s, to which two of the four now seemed to support. What had the entire struggle against the militant Left, the Unions and Labour been for if the EU could undo it all with the stroke of a bureaucrat’s pen? In hindsight, any eurosceptic reading Sergeant’s book wouldn’t look at Thatcher’s legacy as disruptive or fatal - far from it. What was the point of being in government if another institution had legislative, even executive authority? The legacy, Sergeant writes, continued into the Hague and Duncan-Smith years with the Tory position on Europe becoming less accommodating to ‘ever closer union’, so that when the Tories were in government, they could act like one. As determined as the critics may be to see her legacy as one of party warfare, it is to miss the point. The Thatcher legacy had been about authority, stamping her authority on the party, reasserting the authority of the state from the Miners and militants and finally, reclaiming sovereign authority from Brussels. Sergeant’s book, in focusing on the post-government Thatcher years and the European question puts it all into perspective of the wider Thatcherite programme and allows the reader to develop their own analysis on the Thatcher and Major years. A helpful book, it comes highly recommended to anyone who wants an in depth, detailed view of the Thatcher legacy. Thanks for your review which I very much enjoyed. I won't have to read the buy or read the book now! I wonder what "Stating throughout that he is not of the conservatism of the time" means. Why did John Major force through Maastricht with such determination? Did he get to the leadership because he had agreed to get it signed, while acting up as eurosceptic to the sceptics? Hague is equally duplicitous. He sounds euroscepticish, but ensures that David Cameron cannot get the Party out of the EPP, and promotes the Movement For European Reform as a kind of fudge a bit like Keep the £ For One Parliament in 2001. The only leader with genuine eurosceptic credentials was IDS. If the eurosceptics who had split off to UKIP had come back into the Conservative Party to support him by 2003, IDS might have survived. Cameron appears to be eurosceptic in his beliefs, but he has obviously done deals with Hague and Ken Clarke to put Europe on the back burner at least while they win power. Currently the Party runs as a coalition between the majority eurosceptics and the rump of europhiles who control the media and who are now controlling the inflow of new candidates. If only UKIPPERS understood what was going on, they would get back in and fight to purify the candidates being selected constituency by constituency. Tragically they are wasting their time, blocking Conservative eurosceptics from getting to Westminster. Maybe Farage can do something and get the sceptics back into the game. The battle for Britain's survival is now the battle for control of the Conservative Party. Cameron will need all the help he can get if the europhiles are to be finally defeated. Quote from introductory commentary:"The Thatcher legacy had been about authority, stamping her authority on the party, reasserting the authority of the state from the Miners and militants and finally, reclaiming sovereign authority from Brussels." As the commentary itself points out earlier, reasserting the authority of the state is meaningless when the state has been taken over by a superior state based in Brussels. Thatcher certainly did not reclaim authority from Brussels - her shameful legacy is of taking Britain much deeper into the superstate - if she didn't realise what she was doing then she should be equally deeply ashamed. "I wonder what "Stating throughout that he is not of the conservatism of the time" means"
It means John Sergeant wasn't a Thatcherite or supportive of Lady Thatchers politics. He could be a conservative now, but i wanted to make it clear he didn't exactly support the Thatcherite way forward. The record shows that Lady T was in favour of a "yes" vote in the 1975 referendum. She did not appear to have any doubts until she came up against her EU partners when in office. Her biggest mistake - and it looks as though Tony Blair is about to repeat it- was not to find a successor to carry on with her policy. When you think about it, it is extremely difficult to know who will command the loyalty and confidence of the party, or even when the hand-over will occur. Thanks Tim, I think I know what you mean. FWI I thought Maggie was great, consider it great that I once met her, and would not feel comfortable in today's Conservative Party which is why I have yet to renew my membership since Cameron and his fellow travellers took over the leadership. Good site! Thank you! Online casino game free - Free Online Casino, [url=http://www.quizilla.com/users/Free-Online-Casino/journal/]Free Online Casino[/url], Free Online Casino Game, [url=http://www.quizilla.com/users/Free-Online-Casino/journal/604022/free_online_casino_game/]Free Online Casino Game[/url].